The biggest expense in real estate is opportunity cost! The statement can be justified with great confidence in today’s scenario when buying a property can be an expensive affair. Renting a property may seem a bit simple with so many intermediaries like brokers, online platforms, but keep a vigil on the various basic and critical clauses to be incorporated in the formal rent agreement. Your stay as a tenant can be smooth only when you have the awareness and incorporation of all the mutually agreed rental agreement clauses. It is a mutual agreement between the owner, termed as “Lessor”, and the tenant, termed as “Lessee”, to rent a property. The provisions relating to control of rent are specified in the “Maharashtra Rent Control Act 1999”. A rent agreement is a legal document that binds both the parties in their limits and also provides rights to them. Therefore, it gives the right of “occupying the property” to the tenant and the right to receive a mutually agreed “Rent” to the landlord. In addition, mentioning mutual rental agreement terms and conditions eliminates any chances of dispute or disagreement at any point in time. Both the parties are at ease and are aware of their rights and limitations. You must ensure that a few critical points are taken care of while preparing the rent agreement, especially when the rented property is commercial. All points mentioned below must be incorporated or talked about and clarified between the lessor and the lessee. There is usually a tradition of keeping some amount as ‘Security Deposit’ across various cities in India. It is generally ‘X’ number of times the monthly rent. The number can be discussed between the parties.. This amount is kept with the landlord for settling any dispute, meeting expenses towards repairs at the time of the tenant vacating the premises. Importantly, though it is implied that the security amount is refundable, it should be incorporated in the rent agreement as ‘Security Deposit is Refundable’. The exact period of the rent to be paid should be mentioned in the rent agreement. That means whether the rent will be paid when the month starts, i.e. in advance, or paid after the month is over. This point occasionally becomes a point of dispute while the lessee vacates the premises, and should always be avoided. The agreement period is generally kept as 11 months and should be mentioned in the rent agreement. In case there is any lock-in period, that should also be mentioned. The lock-in period signifies that both the parties are bound by the agreement till that time. Generally, there can also be a provision that either party may terminate the agreement upon prior written notice to the other party. Most rent agreements do not talk about any penalties, but at the time of vacating the premises, disagreements or disputes occur in terms of the refund of security deposit. To avoid such disputes, a clause of penalty should be incorporated. It can be in terms of holding the property until the security amount is refunded. Any maintenance or society charges wherever applicable and who will pay the same should also be mentioned in the rent agreement to avoid any conflicts. Electrical fittings and fixtures provided by the landlord should be returned in the same state by the tenant at the time of vacating the premises. This clause should be mentioned in the rent agreement, stating the complete items in detailed quantity and condition. 7. Government taxes to borne by? Property tax or Municipal taxes payment can be borne by either of the party and must be agreed on and mentioned in the rent agreement. Any damage or loss of property and its repair must be done and the responsibility of the same should be mentioned in the rent agreement. It should be mentioned in the contract as to who reserves the right to renew the contract and when exactly that can be done. A clear description of the kind of alteration to the property, allowed to the tenant, should be mentioned in the rent agreement to avoid any dispute. You must have come across a term ‘Leave and License Agreement’, which is considered similar to ‘Rent Agreement’. You must not get confused by that as both the terms are different and carry different meaning and relevance. As stated above, rent agreement is the ‘transfer of interest’ from the owner to the tenant, and the tenant can defend his rights over the property. It is both transferable and inheritable as the interest lies with the lessee. 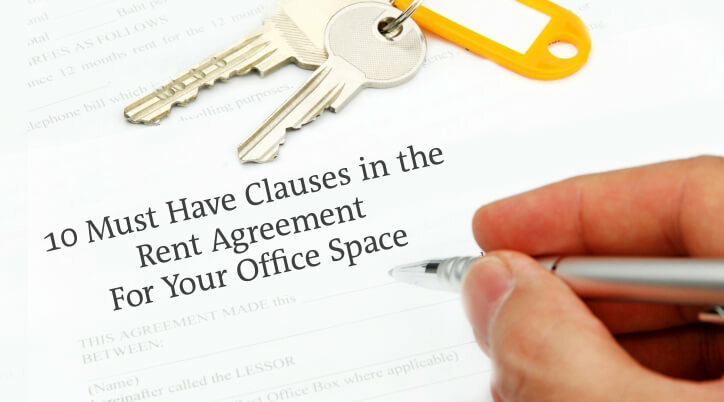 Though the agreement comes to end at the completion of the agreed period of the contract, the tenant can hold the property beyond the agreed period and that will not be considered as ‘unlawful’. On the other hand, a ‘Leave and License Agreement‘ is just the permission of the landlord to the tenant to use the premises without the transfer of interest. If the tenant does not vacate the premises after the cessation of license, it will be considered as ‘unlawful’ and action can be taken on an immediate basis. Find more details with deAsra’s the Leave & License/ Rent Agreement Checklist. The association between a tenant and a landlord, especially when it is a commercial space must be cordial and one must keep it that way. The key to success is the complete awareness of the rental agreement clauses.